The UBC Department of Mechanical Engineering didn’t start out in an independent university. Instead, with the help of McGill University, it started as a university college called McGill BC. Students could take a two-year program after which they would have the opportunity to transfer to McGill University in Montreal to complete their degree in Applied Science. Impressively, unlike other universities during that time period, McGill BC did not solely cater to the higher-class and wealthier students. It admitted a variety of students; some were sons of storeowners and engineers, but others were sons of carpenters and lower income labourers. It became popular for those who wished to stay close to home to start their studies at McGill BC. McGill BC taught its first students in 1907 with classes held in empty classrooms of a nearby high school. As enrolment grew they moved to the hospital where the Fairview Flats were built as bare-bone classrooms to hold the growing number of students. 1911 was when Mechanical Engineering became its own department. Although McGill had control over the academic courses, the campus in Vancouver controlled their own practical and hands-on courses. The new department was permitted to set and mark exams for these courses. In addition, they had one of the most impressive equipment budgets when compared to other universities; allowing students to gain a strong practical understanding. The Department of Mechanical Engineering took the initiative and opportunity to make a name for itself. Their hard work and dedication is the only reason why the Department has the calibre it does today. 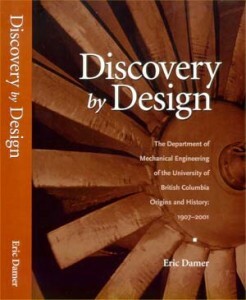 To learn more, read Discovery by Design: The Department of Mechanical Engineering of the University of British Columbia. Origins and History: 1907-2001 by Eric Damer.